Welcome to another installment of Stone Skin on the Rocks, our weekly column where our authors provide a liquid pairing suggestion for their short fiction. This week brings us an entry from Jesse Bullington, who’s not afraid to refer to himself in the third person. While Bullington has worn more than one hat for Stone Skin Press over the years, today entry focuses on the first story he published with us, which appears in The New Hero Volume 2. When settling on a drink to pair with the story, I initially considered a gin cocktail, since our narrator is sipping one at the start of the tale. As I re-read the story, however, I realized I’d screwed up–Weegee tells us he’s drinking a Rickey, but from the description we can tell he’s clearly drinking a Gin Fizz. Maybe he had one too many at the Carousel before putting his thoughts down on paper? Whatever the cause of the mix-up, I decided this was a sign to direct this column toward the other obvious choice: rum, or even better, rhum. Why is this the other obvious choice? Because it figures prominently into the practices of Claire Simons, a fictional character who plays the Vodoun priestess Holmes to Weegee’s shutterbug Watson. Why the H in that rum? Because “rhum” short for “rhum agricole,” which is rum that is distilled only from the juice of the sugar cane, as opposed to molasses, which is more common. Just as all Scotch is whisky but not all whisky is Scotch, so is all rhum rum, but not all rum is rhum. Ruuuuuuuuum. Rhum is probably Haiti’s most popular export, other than Vodou, and the link between the two was not something invented to suit this story. Baron Samedi, the loa summoned by Mrs. Simons, is very partial to strong liquor, and so she keeps overproof rhum on hand for when she summons him (as well as a good cigar). The Baron drinks his rhum straight, and so should we, for despite its good name being dragged through the gutter by certain dubious pirate captains, quality rums are every bit as nuanced and sippable as fine Scotches. Well, okay, maybe you don’t have to knock it back neat like the Baron does: a little ice is acceptable, and a touch of lime if the spirits so move you. As for what rum to use in particular, the thirsty reader is spoiled for choice. 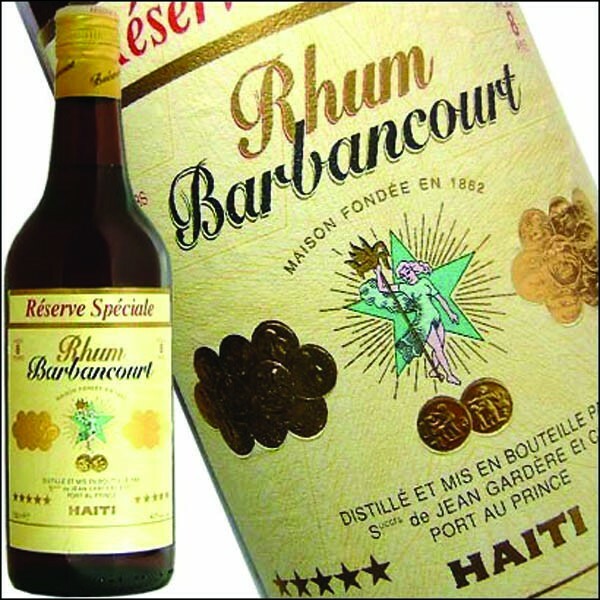 Rhum Barbancourt is far and away Haiti’s best known rhum, and with good reason: available at a variety of different ages and priced to please, both their 4 year old and 8 year old offerings are great introductory rhums. If you are trying to curry the favor of a loa you’ll want something stronger, though, preferably Clairin, which is Haitian moonshine. Don’t feel bad if you can’t scare any up, though–even our mambo Mrs. Simons can’t score any in the story, and has to make do with overproof rum from another island. Mrs. Simons calls her rum Babash, which is overproof homemade rum from Trinidad and Tobago (among other islands). It’s such a ferocious spirit it’s been outlawed across the board, but thankfully for us Trinidad and Tobago do export several lovely rums, some of them from the House of Angostura. That name ought to ring a bell for any self-respecting tippler, as Angostura Bitters are a staple in any bar. They present a slig htly different range of ages than Rhum Barbancourt, but not being distilled purely from the sugar cane itself, Angostura has many rums but no rhum. Whether or not the illicit Babash mentioned by Mrs. Simons is a rhum or merely a rum is a moot point, as she doesn’t actually possess the spirit she thinks she does. Scoring overproof island rum in the 1940s was a tricky business, even in New York, and so while Mrs. Simons believes her supplier when he tells her the rhum is moonshine from Trinidad, it is actually sourced much closer to her Haitian homeland: Jamaica. The tell is when Baron Saturday samples the bottle and pronounces the hooch to be Jankro Batty, which is illicit Jamaican rum alleged to be so powerful it will singe your nose hairs. This brings us to our final suggestion, an overproof Jamaican rum called Smith & Cross. At 57% alcohol, it qualifies as a “Navy Strength” tipple, but is still a far cry from the rumored potency of the island’s Batty. This one should be attempted only in small doses, for obvious reasons! Had I more time, I’d wax philosophical on the glories of Ti Punch, but since I’m rum-rambled long enough I’ll leave you all in the capable hands of David Wondrich. Cheers! If you haven’t already, try rhum, lime, ice and coconut water. It’s good, especially on a hot day.